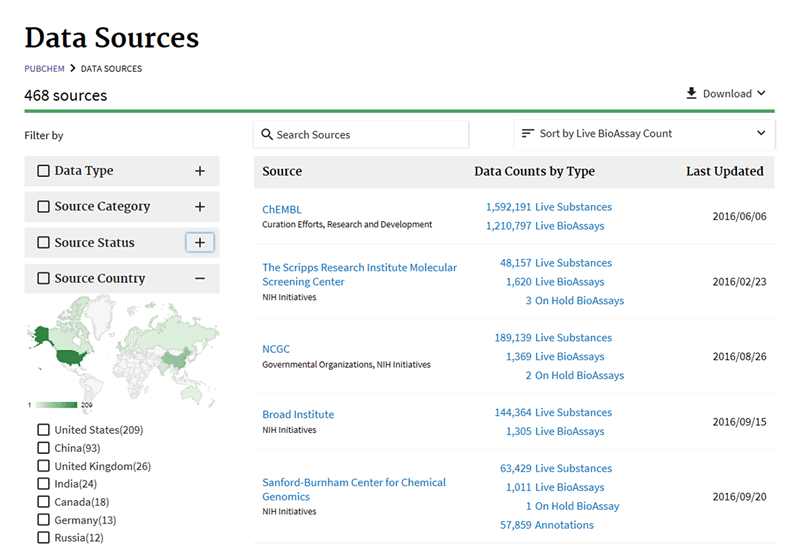 The PubChem Data Sources page is now updated. What is the Data Sources page? 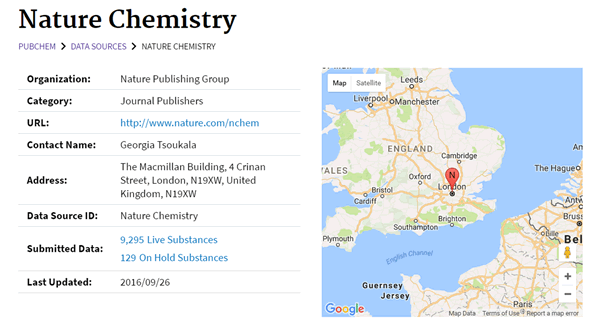 As an archive, PubChem contains information from hundreds of sources from all over the world. Contributors can provide different types of content, such as substances, bioassays, and annotation. The Data Sources page is an interface that helps one to determine, among other things, who provided what information. As a part of an underlying technology update of PubChem, this page has been completely overhauled with a new look and feel. The categorization describing the organization types providing content was simplified. Sources of hierarchical classifications and textual annotations are now included. There is now a unified data source table containing all primary information. The updated interface provides new and improved capabilities to navigate as a function of data type, category, and country, while also including keyword searching, counts, and geographic visualization. A panel (on the left-hand side of the screen) now summarizes (by count) key aspects of PubChem data sources. By clicking the check boxes, one can filter the data sources listed. Classification of the type of information provided to PubChem. This includes the ability to consider data ‘on-hold’ (to be released at a later date). General-purpose groupings that describe the contributing organization. Separates active contributors from legacy. As explained in this post, some contributors or projects no longer exist (although their contributed data may still have substantial utility or value). PubChem data contributors span the globe. One can now filter and visualize by country. The improved Data Sources page allows users to sort by record counts and last-modified date. For example, sort by last-modified date helps to identify organizations who recently updated their content. As with other PubChem pages developed in recent years, great effort is taken to make the page adapt to the unique experience of mobile devices. This means that without sacrificing features, the layout scales and complexity adjusts to match the appropriate screen size. If you click on a data source link in PubChem, it now directs you to a dedicated page for that depositor. Beyond showing contact information with its location displayed on a Google Map, it provides the date content was last updated and the current counts of submitted records. This entry was posted in PubChem Explained, What's New by PubChem. Bookmark the permalink.